Here's your chance to own the best of the best! 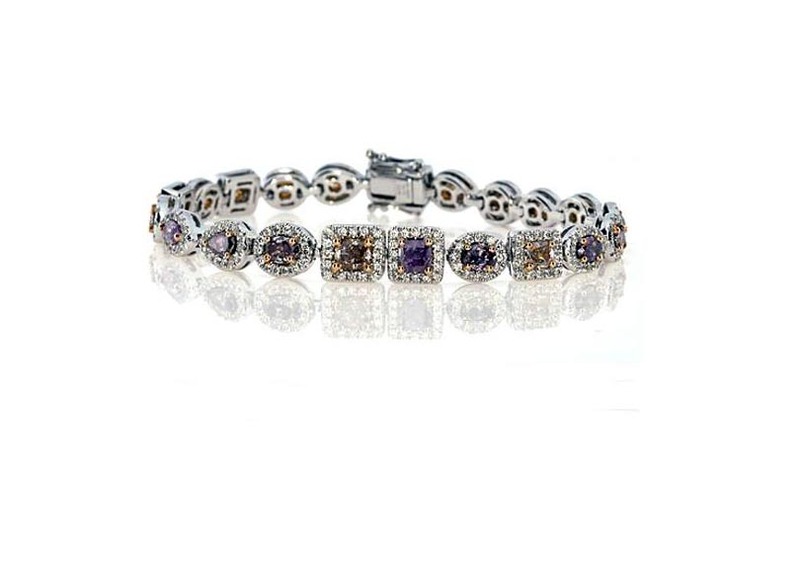 One of a kind, purple diamond bracelet. From 'I Got Your Silver Lining' Fine Jewelry's premiere, IGYSL Collection this is brand new as part of our purple diamond collection, set in 18KT White Gold, weighing a whooping 21.5 grams. 100% Investment Grade. GIA certification included. Other specifications of this beautiful Pink Purple & White Diamond collection include: 21 Pink Purple Diamonds, weighing 4.75ctw, VS Clarity, various shapes. All excellent cut. These natural colored diamonds are surrounded by crystal clear white diamonds, 274 round cut, weighing 1.82ctw. Designer signed and all diamond weight as well as the precious metal purity is part of the bracelet's hallmark. Retail List: $99,999, IGYSL List: $69,900, Promotional Opportunity (for a limited time only): $42,900. *Treatment Disclosure: N (Not Enhanced), 100% Natural, straight from Mother Earth, only polished and cut! Click the button below to add the Natural Purple Diamond Bracelet to your wish list.